Embroidered lacy and mesh pattern overlays all the bag. Lovely colors and pattern that's perfect for seasonal outings. Double handle/shoulder strap with 10.00" drop. 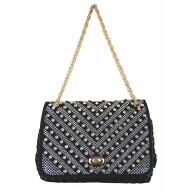 Rhinestone with buckle accent at flap. Interior features 2 zip pocket; 3 open slip pockets. 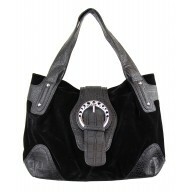 Double handle/shoulder strap with 11.50" drop. 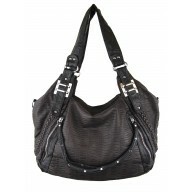 Second adjustable shoulder strap or crossbody wear with 28.00"-50.00" drop. 2 front vertical zip pockets. Chain-link shoulder strap with 12.00" drop. Suede and leather mix woven. 2 compartments, front compartments Interior features 2slip pocket, back compartments interior features 1zip pocket. 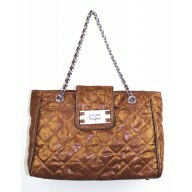 Glossy faux leather and suede patchwork at front. Interior features zip pocket, 3 slip pockets. Chain-link rope shoulder strap with 10.00" drop. Size: 9.50"L x 2.00"W x 4.25"H inch. An sparkle-embellished bow on the front. Interior features lining and open pocket. Metal frame closure with hardware clasp.